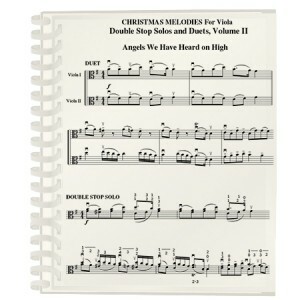 Volume II of Christmas Melodies: Double Stop Solos and Duets For Viola is considerably more challenging than Volume I. (Please read the Foreword by William Preucil by clicking the Forewords Button located here or at the top of the navigation bar on the Home Page.) The double stops involve the use of the 4th finger and occasional triple stops. Students should be in at least the end of Suzuki book five or the beginning of book six or, have studied concerti by J. C. Bach or Handel. 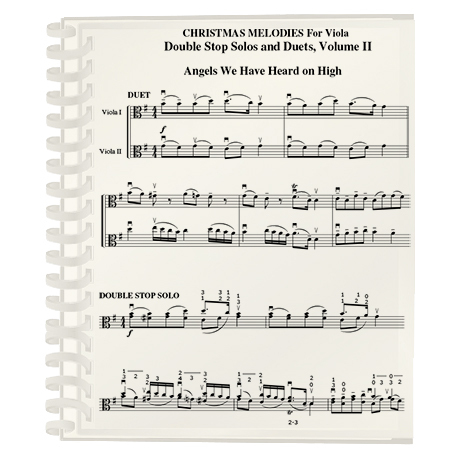 Like Volume I, arrangements of Christmas Carols appear first as duets, with the exact same notes then rewritten for one player as a double stop solo. This is a very challenging Volume (I have to practice these arrangements every Christmas! ), but it’s a fun way to improve your technical skills on the viola.